The Stepfather had a severely limited theatrical run back in 1987, but everyone who managed to seek it out did nothing but sing its praises. My brother was among the lucky few to catch one of the greatest sleeper titles of the 1980s in theaters, and even though I was only eight years old at the time, his constant accolades around the dinner table managed to stick in my brain. Once Embassy Home Entertainment released it to VHS it managed to find its following. And it was because of the success on video that a direct-to-video sequel was commissioned. Terry O� Quinn (as the titular madman) was tapped to return for what would be another go �round of the Stepfather�s relentless pursuit of the perfect family. It probably sounded like little more than a creatively bankrupt cash-in on a quality title, but the biggest surprise wasn�t that a Stepfather II was made (this was the last 80s, after all), but that it ended up being really, really good. So good in fact that what started out as a direct to video sequel wound up going to theaters. Director Jeff Burr took a long, hard look at what made The Stepfather work and worked within the established formula to deliver a sequel with good performances, solid writing and some nasty little bits of gore. In fact, its biggest drawback stems from that fact that it�s a sequel and so the surprise factor is significantly diminished. If you�ve seen the first, you know what you�re getting into. Although while part II does tread familiar territory, it also has some surprises in store for those ready for a second helping of close to home carnage. If you can swallow the fact that the Stepfather somehow managed to survive the surplus of wounds he incurred at the climax of the first film, the sequel opens with our villain committed to an institution. Of course, he hasn�t taken to the treatment very well and before long, he�s on the loose again. Before being whisked into a familiar retread of the previous events, we see the killer�s methodical selection process in some of the film�s creepiest moments. His sights are eventually set on the Grayland family, Carol (Meg Foster) and Todd (Jonathan Brandis) � after determining that he can successfully integrate himself into their lives. Of course, there�s meddlers along the way (Texas Chainsaw Massacre part 2�s Caroline Williams) who�ve got be dispatched and you�ve got a pretty good idea as to where this thing is heading (although the climax is both awesome and wickedly entertaining). But that doesn�t prevent it from being a ton of fun, loaded with heaps of tension and suspense. No new ground is broken here, but why does it have to be? 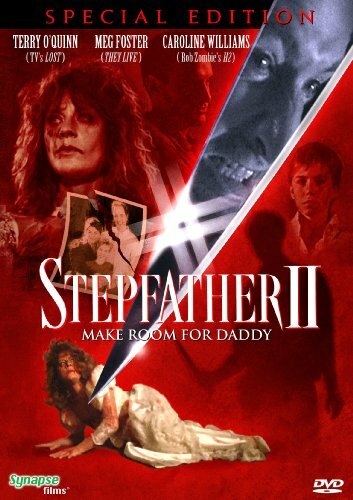 You get what you pay for with Stepfather II: a great, wacked out performance by O'Quinn and solid direction by Jeff Burr (who worked a similar magic with the underrated, if derivative Leatherface - Texas Chainsaw Massacre III) make this the perfect viewing for a Friday night. Recommended. This Synapse port of the Miramax disc is a satisfying transfer - identical to the previous release. Colors are drab by design, but satisfying. The 1.85:1 widescreen transfer looks as good as a microbudgeted flick can look, with no edge enhancement. Print damage and scratches are minor, but present. The Dolby Digital 5.1 surround track offers perfectly clear dialogue (mainly output from the main speaker) and sound cues sparking from the real channels. Nothing terribly special here, but a worthy presentation for what it is. Most of the extra material is again ported over from the Miramax disc, but Synapse did go the extra mile in producing a very cool, 30 minute documentary about the making of this film. Sadly, Terry O' Quinn is absent, but it features conversations with Jeff Burr, producer Darin Scott, actress Caroline Williams and several other members of the crew. It's a comprehensive piece covering the film from its planning stages all the way to its release. A commentary from Burr and Scott is ported from a previous release, but its a worthwhile listen, both humble and enthusiasic. A collection of deleted scenes runs the gamut from snipped character bits and alternate murders. Very cool to see for fans of the film. With the original film heading to DVD next month, there's no better time to pick up this Synapse release. Sure it's not up to par, but it makes a good double feature and the extra material is really cool stuff.